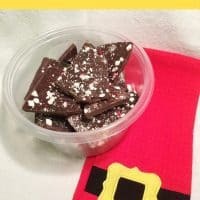 Enjoy this super easy Christmas Peppermint Bark recipe made with semi-sweet chocolate, peppermint candies, and red & green sprinkles. While I love traditional Peppermint Bark, made with layers of chocolate and white chocolate, I decided to throw together a peppermint bark with some ingredients that I had on hand, which did not include white chocolate. Also, I didn't have any candy canes on hand but I had round peppermint candies, which worked just as well. I think this Christmas Peppermint Bark came out amazing, and it will be perfect for complimenting my cookie platter this Christmas. 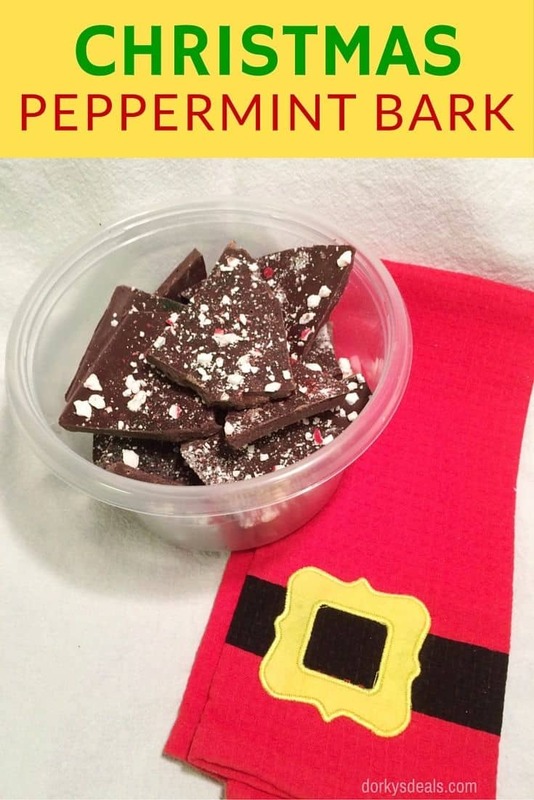 This recipe goes to show how much fun you can have customizing a chocolate bark recipe. You can really throw anything on top of chocolate and it will taste amazing! Line a 9" x 13" baking sheet with aluminum foil, shiny-side up. Smooth out any wrinkles, then set aside. Place peppermint candies in a plastic baggie. Crush into small chunks using meat tenderizer, then set aside. Melt chocolate either in a double boiler (recommended) or in the microwave, carefully stirring at 30 second increments. Pour melted chocolate onto prepared baking sheet. Tap baking sheet on counter to help the chocolate spread evenly and remove any air bubbles. Sprinkle immediately with the crushed candy and colored sugar. Place in refrigerator until firm (at least 45 minutes). Use foil to lift out of baking sheet, and break into pieces. Store in an airtight container. While Peppermint Bark can be stored at room temperature, I would recommend storing in the refrigerator to keep it from getting soft. Mmmm I just love anything peppermint. With the chocolate you can’t beat it! Perfect for the holidays. This looks so good – going to make some this evening! That looks so good! I love the combination of peppermint and chocolate. Chocolate and peppermint – sounds like a winner to me. I’ll have to try this recipe. I LOVE this recipe! I have two pounds of chocolate sitting in my kitchen cabinets and now I know what to do with it! Thanks! It’s so true how versatile it is. I love how you made and decorated yours! 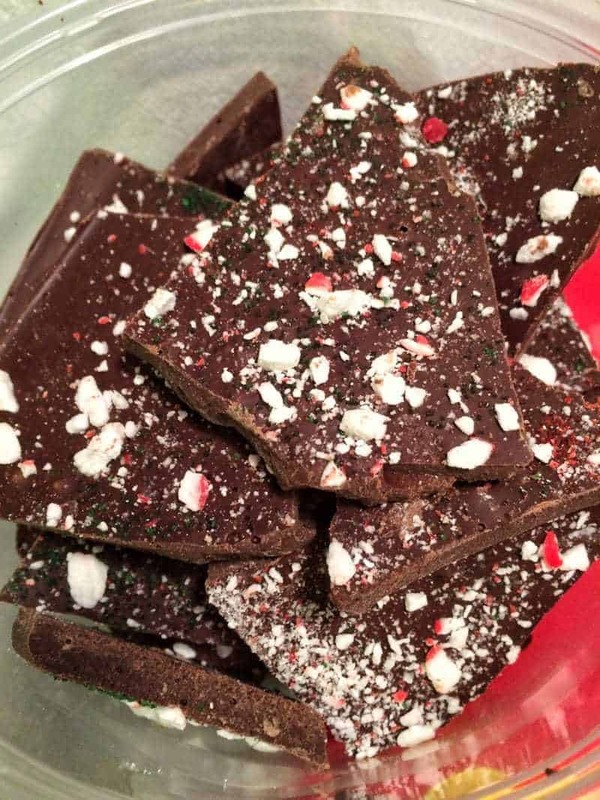 We like to take chocolate or white chocolate peppermint bark pieces and stir them into homemade cocoa. Delicious! Chritmas Bark, but had never made it. Thanks for the recipe. Oh boy that’s a good looking bark. I’d love to make it, try it or gift it. Maybe all of the above! I think this would be very good for Valentine’s Day. This looks really yummy; I’m sure I would enjoy this all year round! Thanks for posting the recipe. I would probably add pistachios to the bark . I love Christmas bark. I love peppermint bark. Have to try this. This would be fun for a 4th of July dessert. I’ve never had a chocolate bark before. I’m so looking forward to making this! Peppermint bark has always been one of my favorite holiday treats. It will be so nice to finally be able to make it at home! We love peppermint bark.Chocolate will make it twice as good. I love anything peppermint. I had chocolate peppermint cookies and they were amazing, so I bet this is just as good I want to try it!